In 1956, Mickey Mantle reported to spring training just after having his tonsils removed. In late February he played in the Tampa Palma Ceia Golf Club annual baseball-players-and-sports-writers golf tournament. Mickey was a late comer to the game of golf, and the Yanks were only allowed to play golf during spring training. Mantle was paired with pitcher Whitey Ford. Perhaps Mickey’s most notable exhibition game that season occurred in mid-March against the Cardinals at Al Lang Stadium. Times sports writer Red Marston reported “The village blacksmith from Commerce, Okla., Mickey Mantle, muscled a hanging curve over the left field fence and on into Tampa Bay to give the New York Yankees three runs in the eighth inning.” The pitcher was rookie right-hander Bob Mabe. “He put the pitch up there. 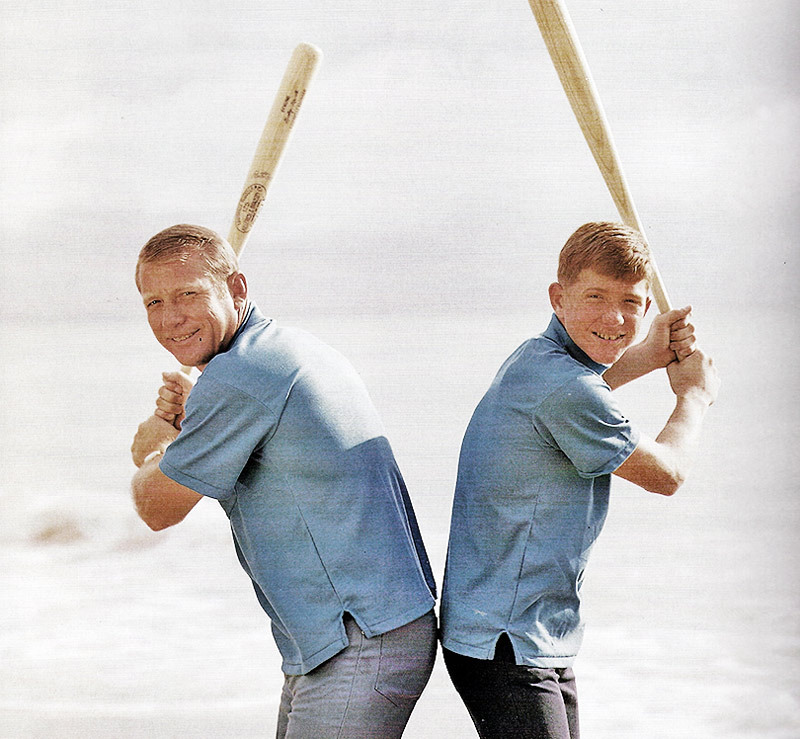 And Mantle put it out there… Mantle gave the game-winning poke a Cadillac touch by hitting the ball left while batting left handed.” Mickey’s “bicepolar blast” actually hit the ground once before hopping into the bay. Overall that spring Mickey’s batting was exceptional. He struck out only once, and not until the twelfth game. He hit six home runs, two into the bay. Stan Musial commented regarding one, “No home run has ever cleared my head by so much as long as I can remember.” After spring training, Mickey went on to win the American League Triple Crown during the regular season. 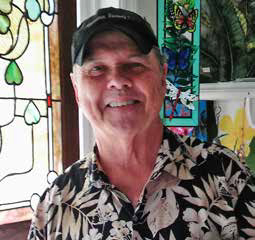 John Messmore is the owner of the Sweet Sage Café at North Redington Beach and a nearly life-long resident of greater St. Petersburg. At the age of 12, he went to work for famed photographer Ozzie Sweet, known to some as “the Babe Ruth of Sports Photography.” Ozzie has over 1,800 magazine cover photos to his credit. When Mickey began his majors career in 1951, Ozzie was doing photography for Sports Magazine and John was hired on to assist. One of John’s jobs was to help with the light reflector. Mickey was one of John’s and Ozzie’s principal sports subjects. John remembers him as “just great, mild mannered, and a gentleman… down-to-earth… comfortable to be around.” While many shots of Mickey were taken at Al Lang Field, one in particular stands out. 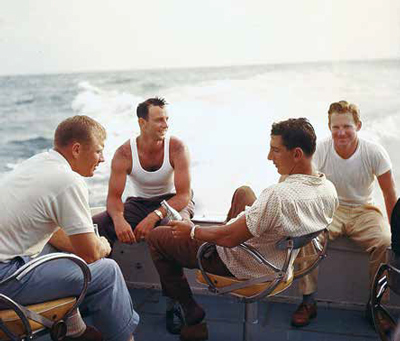 At the end of the ’56 spring season, Ozzie came up with the idea of taking Mickey and some of his team mates on a fishing trip out of Madeira Beach. Mickey enthusiastically agreed along with Billy Martin, Whitey Ford, and Bob Grim. When they got to the boat, none of them had hats and Whitey in particular wanted one as he was very light-complected. The only store selling hats nearby was a ladies’ dress shop. So they bought a ladies sun bonnet for Whitey which he wore. Many candid shots were taken including one famous photograph of all four players conversing, two with Coke bottles in their hands. Ozzie also brought beer (and chicken) but asked the guys to hide the beers and pick up the Cokes when he was photographing. 1957 proved to be a record-breaking year for spring-training attendance with 96,864 fans. During the regular season, Mickey again out-performed becoming the American League’s Most Valuable Player, hit .365, had 34 homers and 94 RBIs. As the ’58 season got underway, Mickey participated in another golf tournament, the Bill Cody Memorial Baseball Players Golf Tourney at Sunset Golf and Country Club on Snell Isle, now the Vinoy Golf Club. His grouping included Detroit Tigers Billy Martin. Mickey entertained the crowd at one point when he missed a putt and then tossed his club into a pond mimicking flamboyant golfer Tommy Bolt. “Florida’s greatest attraction, equaled only by sunshine and grapefruit, goes on display today as the New York Yankees and St. Louis Cardinals slice open the Grapefruit League season at St. Petersburg’s Al Lang Field,” wrote Lonnie Burt of the Times. (The Florida major league spring-training teams were informally referred to as the Grapefruit League.) The Yanks did not fare well in their first game, losing to the Cards 4-0 before a record crowd of 7,072. The Yanks, including Mickey, struck out 10 times. Mickey did not play baseball well that spring due to an aggravated shoulder. The team ended up the spring season with an 11-12 exhibition record. Nevertheless, Mickey went on to finish the regular season with a league-leading 42 home runs and a batting average of .304. The Yankees won both the pennant and the Series. Gulf communities in the 1950s and ’60s. Mickey finally did land his contract which was signed in St. Pete. It was for $80,000. This tied Babe Ruth for having the second-highest baseball contract (not allowing for inflation). Ruth also signed his $80,000 contract in St. Pete, in 1930. The highest-paid baseball player as of 1959 was Joe DiMaggio at $100,000. The Yanks finished the spring season with a 14-11 record, and finished the regular season in third place, their worst record since 1925. Mickey did not perform well in the regular season. There was considerable criticism of Stengel, who was viewed by some as too old and out of touch with the players. In 1960, Mickey again signed his contract in St. Pete, somewhat reduced from the prior year. Then his knee flared up. He did not play an exhibition game until March 24th, against the Cardinals, playing all nine innings, but hitless. The Yankees ended the 1960 spring season by defeating the Chicago White Sox 9-3. Mickey figured prominently with a triple and a single resulting in three RBIs. But overall, the Yankees spring record was dismal with an 11-19 record, worst in the American League. Yet Times sports writer Jack Ellison in an article titled “Can Yanks Regain Series Crown?” wrote at the end of the season that if the Yankees did regain the crown, “you can mark it as a ‘Made in St. Petersburg’ victory.” He noted outstanding play by several veterans, the acquisition of Roger Maris, good pitching, and promising rookies. And the Yanks poor winning record did not hurt attendance in St. Petersburg. A post-spring-season survey showed the Yankees playing as the home team at Al Lang Stadium led all major league teams in the country in home-drawing power with 69,027 fans attending. Bill remembers Mickey as a great athlete. He was particularly impressed by his speed. “He was so fast. He was probably the fastest baseball player of his time. He could run down a fly ball in the outfield like nothing I had ever seen before. He was a great outfielder. He also had a great arm and could throw anybody out at 3rd or home with no problem.” He recalls that Mickey and Whitely Ford were “great buddies, always laughing and joking with each other. But Mickey himself was rather shy… friendly, but not very outgoing. He and Roger Maris were very nice to me. The whole team was very nice to me. Elston Howard also kind of took me under his wing.” Others he particularly remembers are Bobby Richardson and Bill Dickey, one of the coaches and now in the Cooperstown Hall of Fame. Bill Bond, Jr. was batboy for the Yankees during spring training in St. Petersburg in 1960 and saw Mickey play frequently. Circa 1960. Bill Bond and his wife Mary Lee in 2018. Off the field, Bill remembers that Mickey and the whole team loved to go to Derby Lane, the dog race track. They patronized local restaurants such as the Chatterbox on 1st Street South, the Wedgewood on 18th Avenue South, and Moock’s Tavern on 16th Street North. He remembers that later in ’63 or ’64, Whitey Ford and Mickey rented his parent’s beach house during spring training. The last game of the ’60 spring training season was an away game in Sarasota and Casey Stengel invited Bill to go. After the game, Casey presented Bill with a baseball signed by the entire team. “The boys wanted you to have this,” Casey said. Bill continued in the family hotel business, also participating in civic activities. He served on the city council from 1980 to 1988. The Yankees last spring in St. Petersburg was in 1961. Stengel had been replaced by Ralph Houk as manager. On the first day of training, Houk called Mickey into his office. Houk did not believe in team captains, but he made an exception for Mickey. He asked Mickey to step up and become captain of the team. Characteristically, Mickey was reluctant, but finally said, “Ralph, if that’s what you want me to be, I guess I gotta be it.” Aside from Mickey’s obvious outstanding baseball skills, Houk also may have been influenced by Mickey’s ability to play with painful injuries. It was an example the rest of the team respected. Mickey was later to say, “Ralph is the best thing that ever happened to me in my life.” Mickey went on that spring to demonstrate exceptional batting, at one stage batting well over .500. Mickey died in 1995 at the age of 64, but his legacy lives on. In an article written for Bleacher Report by Timothy Rapp on the “100 Most Beloved Athletes in Sports History,” Mickey ranked 6th, after Willie Mays (5th), Babe Ruth (3rd), and Jackie Robinson (1st). A 1952 mint Mickey Mantle sports card recently sold for $2.88 million. So what was it about Mickey Mantle that caught the imagination of a nation and made him a sports hero? Obviously his natural athletic ability was more than exceptional. His accession to the top major-league team at the remarkable young age of 19 also had its appeal. His was a classic rags-to-riches story, only in his case “Poor Boy from Small Town Makes Top Major League Team.” He has also been described as a “tragic hero, ” because of his personal drive to excel, in addition to the usual challenges, while overcoming the challenge of a serious chronic injury. Mickey also suffered from alcoholism, which did not begin to surface publicly until the 1960s. Causes of his alcoholism were several, but perhaps his rapid rise to baseball stardom and all its pressures was a factor, along with a way to cope with the pain of his injuries. What did Mickey mean to St. Pete? St. Pete’s sense of place, including its economy, has long been associated with our paradise-like weather and all the outdoor games and sports that go with that. Engaging major-league baseball and their player icons for spring training was a stroke of genius in gaining national appreciation of this sense of place. Mantle continued in the tradition of Babe Ruth, Lou Gehrig, Joe DiMaggio, Yogi Berra, and many others in helping to perpetuate that sense of place. But Mickey also added to the quality of life in our city on a personal level – a shy guy autographing a baseball for a kid, reluctantly giving an interview to a local reporter, clowning at a charity golf event, and serving as a tangible sports role model for our city’s youth. Sources: St. Petersburg Times (various); Larry Canale, Mickey Mantle: The Yankee Years: The Classic Photography of Ozzie Sweet (1998); Jane Leavy, The Last Boy: Mickey Mantle and the End of America’s Childhood (2010); and conversations with Bill Bond, Tom James, and John Messmoore.